The Board of Directors of the Yonkers Philharmonic Orchestra and the Members of the orchestra’s Conductor and Music Director Search Committee are delighted to announce that Tong Chen has graciously accepted our offer to become the next Conductor and Music Director of the Yonkers Philharmonic Orchestra. We are looking forward to a wonderful working relationship with Tong continuing our mission to bring free live classical music to Yonkers and its surrounding communities. 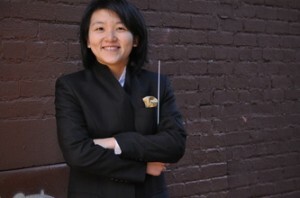 For more information about Tong please google Tong Chen Conductor and go to her web site. The Fine Arts Orchestral Society of Yonkers (FAOS) celebrated its 50th anniversary as sponsor of the Yonkers Philharmonic Orchestra in its 2012-2103 season. The organization sponsors FREE classical music Yonkers Philharmoic Orchestra concerts. In February 2014 the FAOS held its 36th annual Concerto Competition for Westchester County High School students. The winners will receive schoarships and are featured as soloists at a free Yonkers Philharmonic Orchestra "Young Artists Concerto Concert" in May each season. This entry was posted in Press Releases and tagged #music, Yonkers. Bookmark the permalink.